Kav and I survived the first four pages of this goofy adventure, so let's see what we can handle today. Come on kids, let's break it down some more. Kav: This page cracks me up. It says so much about that red headed hamburger, Jimmy Olsen. He thinks to himself, "I'm no military genius....or am I?" 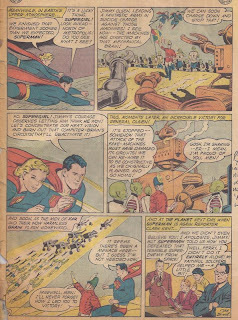 Then he spends a bunch of time getting uniforms and costumes etc together as if this is more important than acting quickly when robots are about to attack Metropolis! Then he says, "These muskets ought to work" even though they are PROPS from a theatrical shop! Yep folks, he's a military genius all right! Tony: Jimmy doesn't think, "I'm no military genius...", he actually says it to the wife beater wearing alien. Was that a trunk of disguises or did Jimmy raid the wardrobe department for The Music Man? 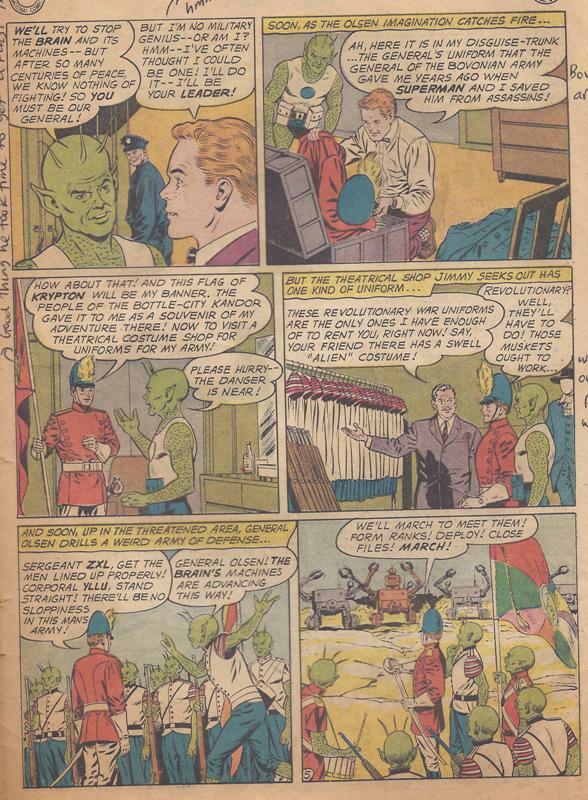 As a historian, my head nearly exploded when the man gave Jimmy and the alien some "Revolutionary War" costumes and muskets. Look at those uniforms, folks. Short sleeves?! I guess that's why the soldiers froze to death at Valley Forge. Muskets?! Those look like rifles to me, you idiot. Does Jimmy think that muskets will stop robots? Not real muskets, but musket props! You may be thinking, "What's with the anger, Tony? These comics were written for children." Shut up. Muskets take forever and a day to load. Rifles can be loaded ahead of time. Are they going to use blanks? Are the guns really loaded? Who uses real bullets on a movie set? Are they filming Earth Invaded or The Crow? 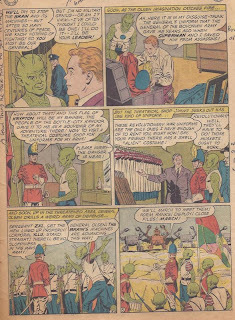 Finally, look at the aliens in the bottom panel. Are there drummers in the army? Oh, that will stop the robot onslaught. Jimmy and his army should die on principle alone. Kav: I can't take much more. Jimmy exhorts his 'army' to 'fire'. Remember, these are PROPS. 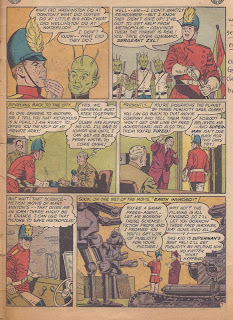 Even Bizzarro #1 could do a better job of leading an army than this dipstick. Then they throw some expansible matter cubes to block the robots, stating it will take hours to break through them or, they could just GO AROUND. Luckily, they're as dumb as Jimmy. Tony: Jimmy threatens his troops with a court-martial? 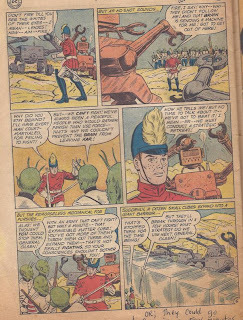 I'm sure the Geneva Convention covers alien soldiers. 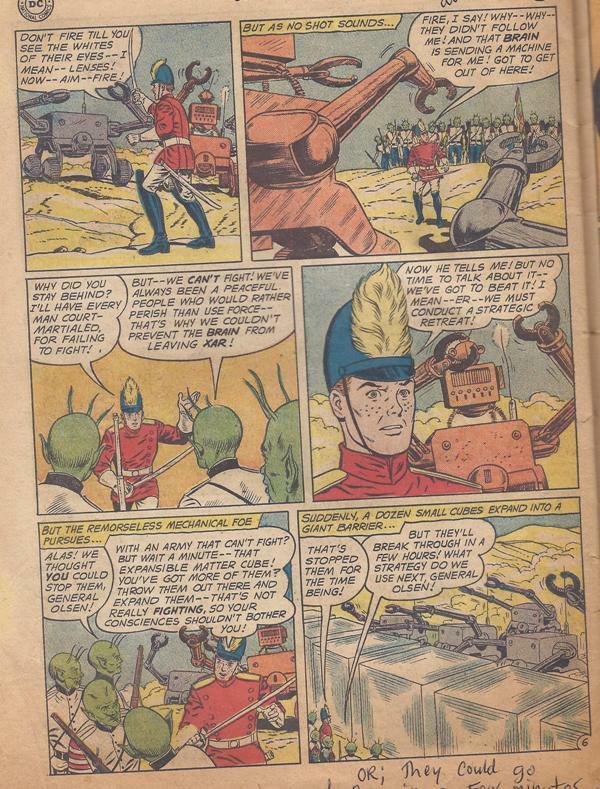 I don't know what's more lame, the painfully slow advancement of the robot army or Jimmy's idiot F Troop. If the robots were created by a supreme brain then they would be equipped with lasers and fry that sad excuse for a military. Oh, the cubes will stop the robots? Why can't the robots pick up the cubes and crush the army? I'm sure there's some guy reading that page thinking, "Of course the aliens don't want to fight. Green liberal hippies". Kav: Sergeant ZXL? Again with the extreme use of the terminal letters of the alphabet. I have just one comment for this page: WORST GENERAL EVER. Tony: These classic comics are absolutely brilliant. 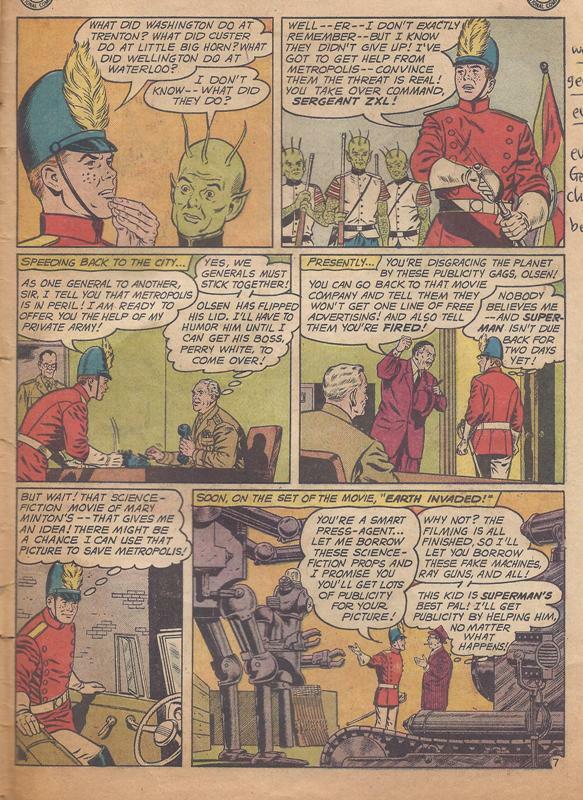 Jimmy walks into a general's office and tries to convince him that he should attack the robots. They make it look like the general has a regular ol' office in the city. I mean it would make more sense to have his office in an undisclosed location on a highly secured military base where morons like Olsen can't bother him. I had to laugh when Olsen wondered what Custer would do at the Little Bighorn. Spoiler alert: Custer died! Also, Custer was one of the worst students in his class at West Point. Ugh, we've got two more pages of this nonsense. 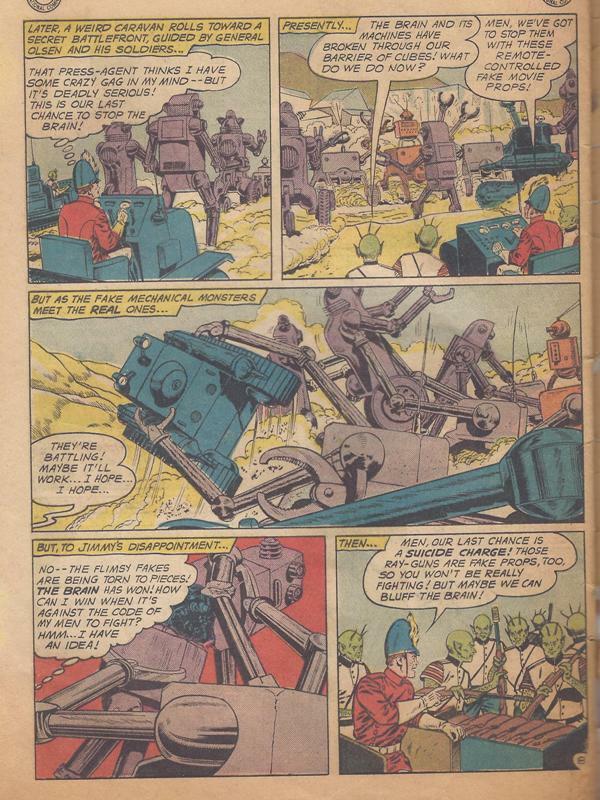 Kav: MOVIE PROP ROBOTS FROM THE SIXTIES CAN ACTUALLY FUNCTION AND FIGHT?????? Then Jimmy gives them MORE prop guns? Yeah, that ought to do it, chump. Tony: Jimmy calls for a "suicide charge?" He watched the evil robots tear the movie prop robots to shreds and thinks it's a good idea to charge them in order to "bluff" them? If I were one of the aliens, I would hit Jimmy over the head with my movie prop to knock him out before he re-enacts Pickett's Charge. Kav: Thank God this is the final page because I don't want Tony to rip out ALL of his hair. Just some of it. As usual, Superman returns from the 'Distant Universe' just when the plot requires it. Advice for the idiot aliens who started the whole mess: DON'T REWIRE THE ROBOT BRAIN!!!! Tony: I don't have that much hair left to rip out, Kav. Thanks for thinking of me. 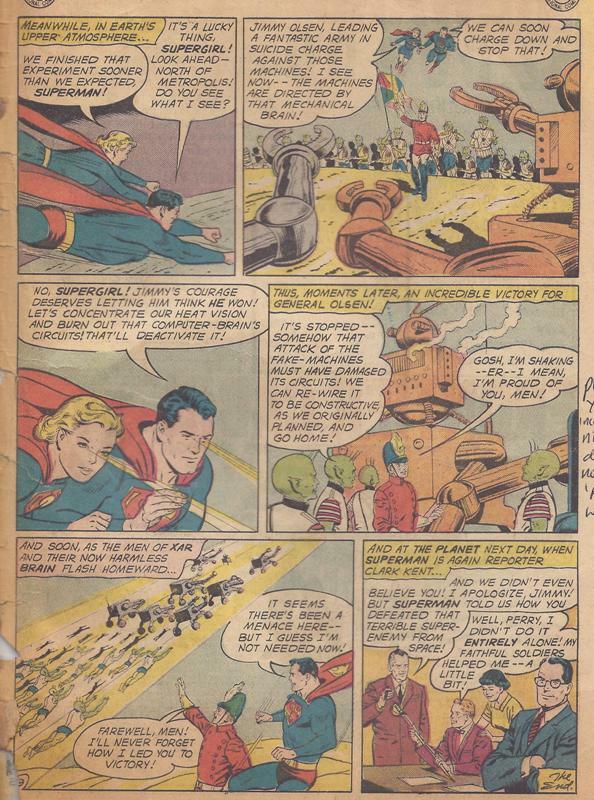 It's sad that all it took to stop the evil giant super robot was a bit of heat from Superman and Supergirl. You'd think the wife beater wearing aliens would have figured that out a long time ago. I mean they built the damn thing! Someone would have realized, "Oh, yeah! The main circuits are vulnerable so let's blast it with a laser." That's all for this edition, folks. We'd love to know what you think about our Kav & Tony series! 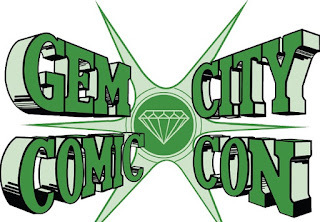 Don't worry, we have another Superman story to break down next week.